Have you ever had a visit from Oscar the Grouch? Remember that grimy grump from Sesame Street who lived in a trash can and liked it? He didn’t have one kind thing to say to anyone. Children with bulging eyes stared at him from afar and adults accepted him with gentle good humor. The creator of that character was brilliant. 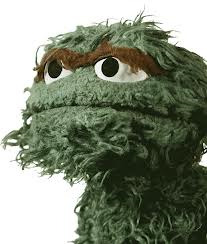 Even though Oscar was obnoxious, we liked him because, well, every one of us has experienced trash can kind of days. More often, each of us have had real life encounters with a grouch, ranging from the snippy comments of an overworked store clerk to the chronic ill-humor of a loved one for whom negativity has turned into an uncontrolled habit. I love the imagery of Oscar’s trash can. Most grouches are contentious because they are struggling to cope with a trash lined life. And sometimes the trash – whether it’s stress, physical pain or illness, relationships gone awry or out-of-control daily events – just gets overwhelming. Most grouches haven’t had the opportunity or willingness to experience the unconditional love only Jesus can offer. Living beside a grouch – now that’s a different matter. I know within my soul that, unlike Oscar the Grouch, most grouches don’t like their trash can any more than I would. And their discontent just makes them more curmudgeonly. My job is to show them grace no matter how personal their irritable comments, glum tones of voice, cold shoulder silences or snarly reactions might seem. How do you handle a grouch? Sometimes the best thing is to do what Oscar asks: “Go away and leave me alone.” There are times, however, we can’t escape a grouch. We’re stuck with them. And that’s when we are called upon to extend a lot of grace and love. I start out with great intentions. I know what Jesus wants me to do. Unconditional love. Blink my eyes, become the adult, and deal with it with gentle good humor. Yet if the person doesn’t soften quickly from my loving words, I get impatient. In spite of my resolve, I fail and snip back. After awhile I’m retreating into my own trash can. I pull myself out and try again. I bite my tongue once more to keep myself from becoming like them. As Mark Lowry said in one of his comedic acts, “If you only knew all the stuff I edited out!” Even the cast of Sesame Street had their fill of Oscar and played practical jokes on him just to watch him get riled. Christ has called me to a higher standard than the good folks on Sesame Street. So, as I try to extend the unconditional love for others that Christ has demonstrated to me, it’s in those moments that I become aware of imperfect grace. My attempts to emulate the grace Christ has shown me are at best, faltering and clumsy. Yes, I’m better than I used to be in handling difficult, negative people. The tip of my tongue is becoming a bit more calloused because I’m biting it more. I’m learning to just go away and leave them alone rather than trying to “fix them” or point out how they shouldn’t be so grouchy. But I am still so far from what I could be or ought to be. My efforts to copy the grace of Christ are downright laughable and must make my Savior want to cringe. By His grace, Christ loves me and partners with me with me through the Holy Spirit to love the unlovely through me. In spite of the smudges of my own impatience and selfishness, His love and grace shine through. That in itself is another sign of His grace.